Every year on 1st of March, Bulgarian people celebrate a centuries-old tradition called the day of Baba Marta (baba means ‘Grandma’ and Marta means ‘March’), related to sending off the winter and welcoming the approaching spring. 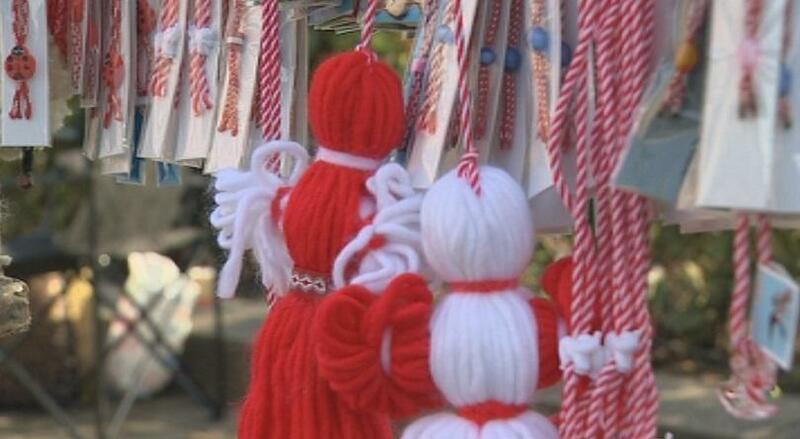 On that day and a few days afterwards, Bulgarians exchange and wear the so-called “Martenitsas” – decorative pieces of red and white twisted threads, symbolising health and happiness and a lucky charm against evil spirits. The Martenitsas are given away to friends, family and colleagues and are worn around the wrist or on clothes. In some villages in the mountains people decorate their houses and domestic animals. 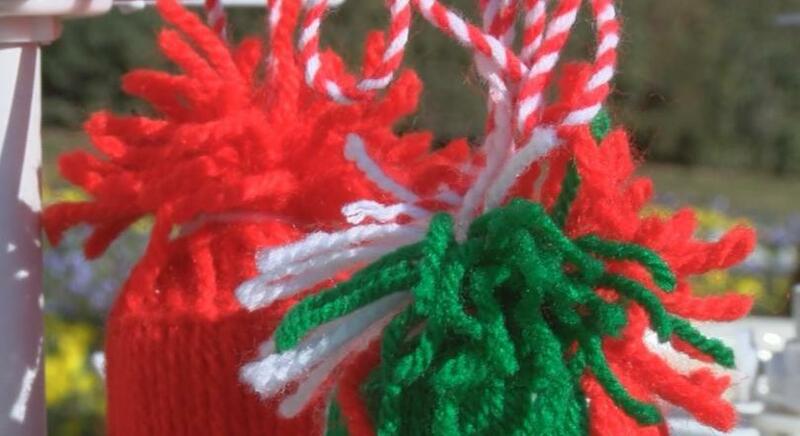 Martenitsa is made of twined red and white threads – woolen, silk, or cotton. The most typical Martenitsa represents two small dolls, known as Pizho and Penda. Pizho is the male doll, usually in white colour. Penda is the female doll, usually in red colour and distinguished by her skirt. Martenitsas come in a variety of shapes and sizes: bracelets, necklaces, tassels, pompoms and balls.The white is a symbol of purity, innocence, beauty and joy. The red is associated with health, vitality, fertility and bravery. According to the tradition, people wear Martenitsas for a certain period, the end of which is usually associated with the first signs of spring – seeing a stork or a fruit tree in blossom. After that people can tie them on a blossoming tree for fertility thus giving the tree health and luck, which the person wearing the Martenitsa enjoyed while wearing it. In Bulgarian folklore, Baba Marta is a mythical figure who brings with her the end of the cold winter and the beginning of spring. Baba Marta is believed to be a grumpy old lady whose moods swing very quickly and it reflects in the changeable March weather. The belief was that when she was smiling the weather was sunny and warm, but if she got angry the cold would stay longer. 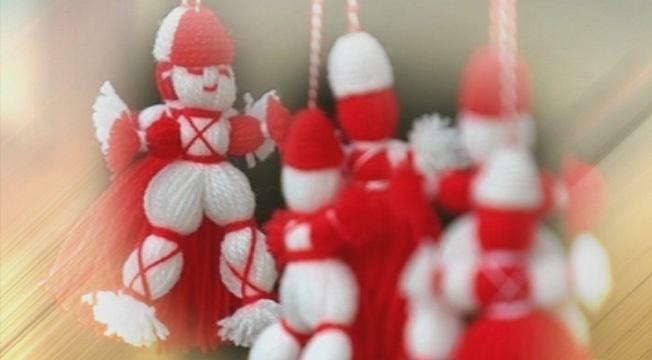 By wearing the red and white colours of the Martenitsa, our predecessors asked Baba Marta for mercy. They hoped that it would make winter pass faster and bring spring. Young and old would take care to keep Baba Marta in a good mood. Young would get up early before anybody else in order to meet the first day of March and rejoice Baba Marta with their youth and beauty. Old women would knit twisted strands of red and white threads to decorate the house. They were believed to protect people from diseases and evil forces. The housewives used to hang out red aprons, belts, rugs or twisted threads in front of their houses, hoping that when Baba Marta saw them, she would laugh and make the Sun shine bright again. The custom of wearing Martenitsa is probably one of the most interesting Bulgarian traditions. According to one of the many legends, this tradition is associated with the founding of the Bulgarian state in 681 AD. The first martenitsa was made by Ahinora, the wife of Khan Asparuh (the founder of Bulgaria) in the second half of the seventh century, when Asparuh crossed the Danube and found the Bulgarian lands. Ahinora, while waiting for her husband, decided to send him wishes for good health and prosperity. She tied a twisted white and red thread to the leg of a swallow and send the bird to deliver the message for health and love.